Adams Heating and Cooling provides heat pump installation, heat pump repair, and heat pump maintenance for residents in the greater Kalamazoo area. A heat pump is a machine or device that transfers thermal energy from one location, called the "source," which is at a lower temperature, to another location called the "sink" or "heat sink", which is at a higher temperature. Thus, heat pumps move thermal energy opposite to the direction that it normally flows. What types of heat pumps are there? There are 2 types of heat pumps: air-to-air and water-to-air. 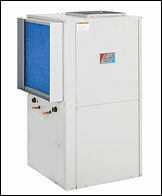 The air-to-air heat pumps are best used for smaller areas such as a single room. Water-to-air heat pumps (called geothermal) can be used for an entire home. Why choose a heat pump to heat your home? The biggest advantage of heat pumps over furnaces or boilers is efficiency. Because a heat pump uses some thermal energy from the environment for part of the delivered heating, it requires less energy to make heat. With the cost of fossil fuels rising, there has been increasing demand for energy efficient methods of heating, and this has made heat pumps more popular in recent years. One disadvantage of heat pumps is that very cold weather can make them less efficient, or, in extreme conditions, stop working altogether. Call us if you have any questions about whether a heat pump is the right option for you. When should maintenance be performed on a heat pump? We provide and recommend annual maintenance of your heat pump. This heat pump maintenance includes general cleaning and analysis of the machine, all in an effort to identify and prevent future problems and expensive repairs. If your heat pump is not working or seems to be having a problem, our certified technicians can identify the problem and repair the machine if possible.